Découvrez notre quintessence Maine Lodge sur les rives de Belgrade Stream. Nos chambres sont rustiques mais moderne, avec tout ce dont vous aurez besoin pour vos vacances dans les Lacs de Belgrade. Nous avons 5 chambres - salle pour tout le monde. Notre propriété se compose de deux hectares privés avec beaucoup de place pour tout le monde. Détendez-vous dans le hamac sur la véranda, le poisson du quai ou en kayak pendant des heures. Nous avons deux kayaks pour votre usage. Le soir, se blottir avec un bon livre par le poêle à bois; ou vous amuser en famille avec notre Xbox 360, sans fil et la télévision. Nous sommes à seulement quelques minutes de Augusta ou à Belgrade Lakes Village avec ses boutiques pittoresques, la plage publique et du centre communautaire et Belgrade Country Club avec ses vues fantastiques. Si vous lisez nos commentaires, s'il vous plaît savoir que le propriétaire a investi une quantité importante de temps et d'argent dans la rénovation structurelle. La salle de bain à l'étage principal est grande et a une douche carrelée. La salle de bain est à l'étage seulement une toilette qui a été installé dans un ancien placard - le plafond est bas. The house was just right—great views, plenty of space. The town of Belgrade was also super cute—we even went to the Sunday farmers’ market! A great weekend stay. If you look at Google maps, you'll see that it is quite close to a lumber yard. IGNORE THAT. The house is nestled in the bend of a river surrounded by trees and feels very secluded and private. There is a huge screened in porch for lounging/napping in hte shade, space for outdoor fun, you can swim in the calm, cool water right off of the dock, hop in the kayaks to head to the lake or up further up the river, or sit around the amazing fire pit and listen to the many loons living on the water nearby. The house itself is a Maine cabin. Old-ish, with the indoor and outdoor spaces flowing together in a great way. Rustic, with very good, large open space for cooking and hanging out together at night or during bad weather. We had three families for part of our stay, and with one shower there was a lot of traffic in the bathroom, but that was manageable especially as we were spending a lot of time in the lake/river. With the rustic-ness of the cabin is an odd flow of rooms and openness so everyone will hear everyone--just like going to camp! All in all a great place for our young families to spend time together near the water and in the fun of Maine. Lovely stay on the water! We had a terrific stay at the Belgrade property for the long Memorial Day weekend. The house has plenty of room for a full family, of all ages. The kitchen is well stocked, the open living spaces are wonderful. We really enjoyed the screened porch where we could enjoy our morning tea and evening drinks and see wildlife in the yard and on the water. Highlights about the house are definitely the wide open spaces and time spent out on the water in the two kayaks. 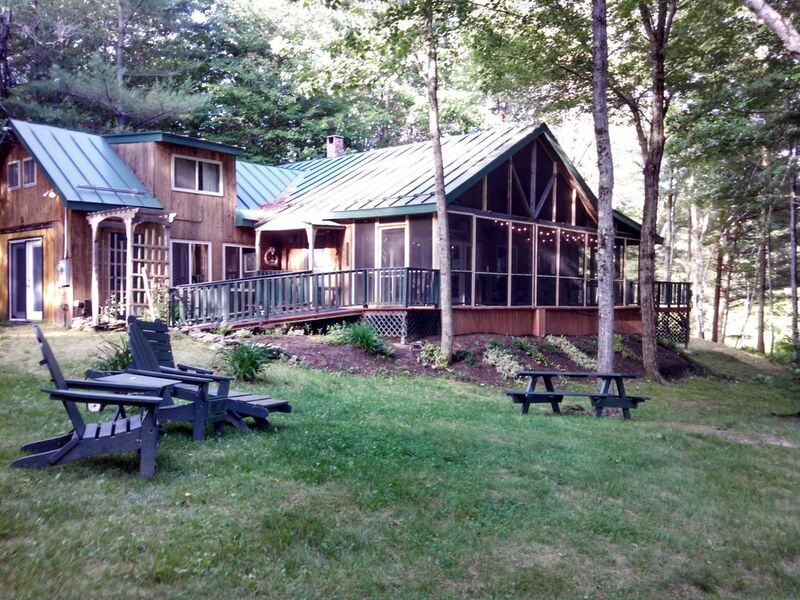 We definitely recommend this house for anyone looking to enjoy the Maine outdoors with a big group of people. Gave it 4 stars only because the neighbors are nearby and they were a bit loud at times on the busy weekend. Overall it was a great vacation with my family. The house had a great open living space. However one bedroom was very small so we did not end up using it. The view from deck and from the kayak rides were very relaxing. The house is newly renovated as described. The house does have a good distance from the neighbor property. However it wasn't as secluded as we would like it to be. We loved the house! It was beautiful with all of the wood. It was right on the water. My two daughters used the kayaks and had a ball. The property was so well maintained. We brought our two dogs and they had a ball walking everywhere. I would highly recommend this house! The back screened in porch was one of our favorite areas! !